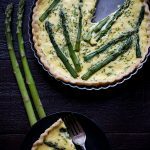 This Asparagus Quiche with Goat Cheese and Chives is a great way to celebrate spring! Not only do the flavors pair amazingly well together, but a few decorative pieces of asparagus laid on top make for a beautiful presentation. I recommend serving with soup or a salad! I want to get on a plane. I want to pack a large bag. I want to open my suitcase and obsess about what goes in it. What will I wear and what shoes will I need? Will it be cold? Should I layer? Will I need to get dressed up at any point during my time away? Should I pack heavy or light? I want to bring everything because a girl needs options. What should I bring on the plane? Which books? Which magazines? Don’t forget gum! I’ve always had an intense case of wanderlust. In college I would drive around the country with friends during our winter and summer breaks, stopping in small towns and taking in the local scenery. These days I love to travel overseas more than almost anything. There are so many places to see and I need more time. I’m getting older. The over-active anxiety center in my brain shrieks at me that I’m running out of time. When I visit a foreign city, I don’t want to leave after a few days. I want to get to know the local scene and the people. I don’t want to just see the tourist traps and take photos next to monuments. I spend a lot of time researching our trips in advance. I get goosebumps during the planning phase. What should we see, where should we eat, where do the locals eat, how do we get around and are we supposed to tip? We gave up traveling when I left my job to attend culinary school. Our last big trip was to Japan, exactly 5 years ago. It has been far too long. Thankfully, the time has come. We recently booked a trip to Germany and the Czech Republic! I am counting the days until we leave. It really can’t get here fast enough. I have a bad case of wanderlust. And so many places to see. PS – if you love spring asparagus recipes as much as I do, you really need to check out this Asparagus Soup with Crème Fraîche and Chive Blossoms! 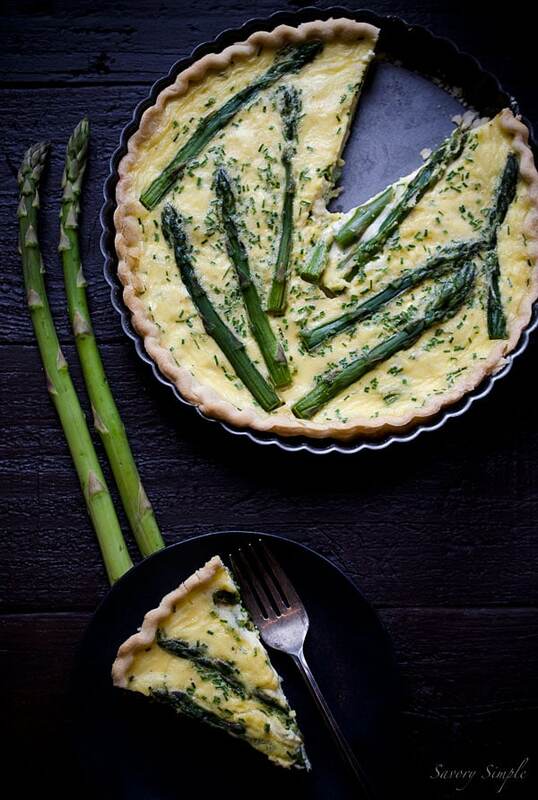 Celebrate the flavors of spring with this beautiful, flavorful Asparagus Quiche. Allow the dough to rest at room temperature for 5 minutes. On a lightly floured surface, roll the dough to approximately 1/4-inch thin. Carefully place into a 9x1-inch fluted tart pan or pie dish. Place the pan in the refrigerator and chill for 30 minutes. Preheat the oven to 400 degrees F. Place the tart pan on a baking sheet. Use a fork to poke holes throughout the bottom of the dough to prevent air bubbles from forming. Line the pie pan with foil over the dough and cover with uncooked beans. Bake for 20 minutes, removing the beans and foil for the last 5 minutes. Allow to cool while preparing the other ingredients. Lower the oven temperature to 350 degrees F.
Slice the asparagus in half. Leave the top halves intact and cut the bottoms into 1/4-inch pieces. Bring a pot of water to a boil and set out a bowl with ice water. Blanch the asparagus (both the top halves and bottom pieces) in boiling water for 1 minute. Drain and then shock in an ice bath to halt the cooking process. Spread 1/2 tablespoon chives evenly in the bottom of the baked pie crust. Sprinkle the goat cheese evenly on top, followed by the chopped asparagus, reserving the top halves for decoration. In a medium bowl, whisk together the cream, eggs, salt, pepper and nutmeg. Stir in the remaining chives. 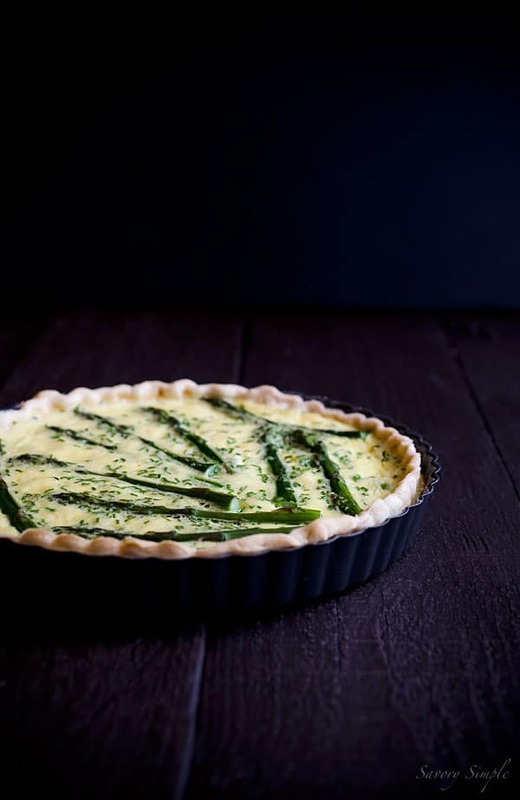 Pour the custard mixture into the tart shell and then gently lay the top halves of the asparagus on top in a decorative manner. Bake the quiche for 45-55 minutes, or until no longer liquid but still slightly jiggly in the center. Allow to cool for at least 25 minutes before serving so the custard can fully set. This quiche sounds and looks amazing! Can’t get enough asparagus lately. This quiche is lovely, Jen! So excited for you and your trip! I studied abroad in that area in college and love it so much – you’re going to have the best time!! You’re going to love Germany. Berlin is one of my favourite cities … just so interesting and a real foodie place, too. I’ve been having a craving for quiche recently. It’s a great meal choice for spring! As always, beautiful inspiring photography. I have perpetual wanderlust too and my next trip starts on Saturday – to Iran. Friday is packing day for me! Sounds liike a great adventure! Beautiful quiche. I’d love to go back to so many places. Japan, Iceland, and Stockholm especially. Fingers crossed. We actually have a layover in London for one or two days before we head home. But we’ll be running around to the sites. We’ve both been to London several times and realize we’ll probably never return. One day I hope to see more of England like The Cotswolds. Well, if you need someone to point you in the direction of decent coffee while in London let me know ;-) but as a general rule, stay away from Costa. I hope it doesn’t rain on you too much! YUMMMM YUMMM YUMMM! Pinning for later! This is a keeper for me! Love these photos Jen! Gorgeous! Gorgeous quiche, you are going to have such a great trip! Lucky you–I’m glad you’ve booked a trip. I worked in Germany for a few years and traveled around on my time off–that was awesome. Still have a dress I bought on the street in Prague, come to think of it. 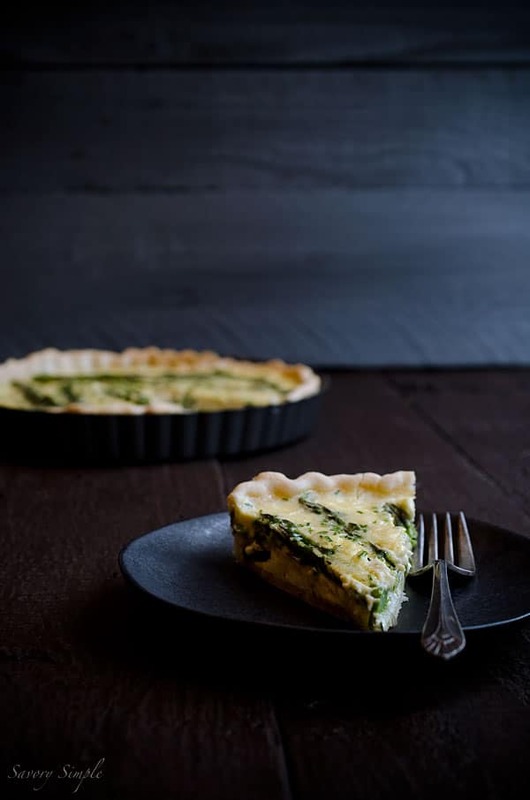 This quiche looks lovely–seasonally perfect! Wow, have a great trip! 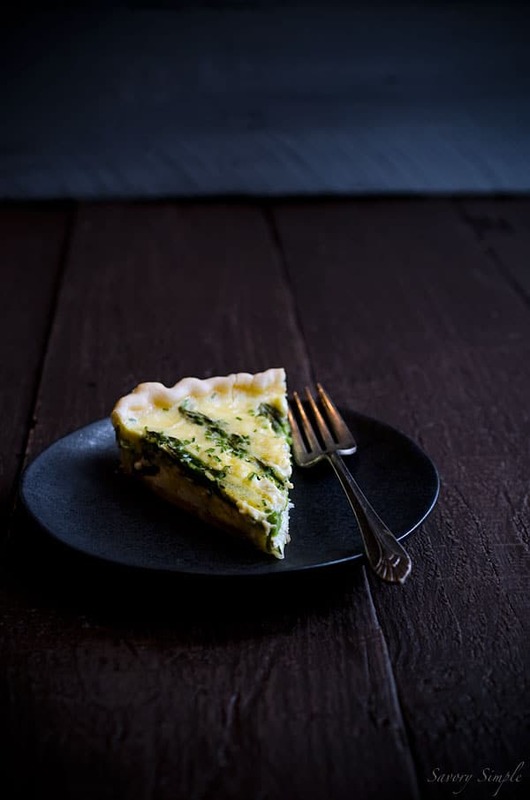 Meanwhile I’ll be trying this quiche; great looking recipe! My dream vacation is Ireland, Paris, and Rome. One day we’ll make it to all three. You are going to have such a great time. This quiche looks amazing.